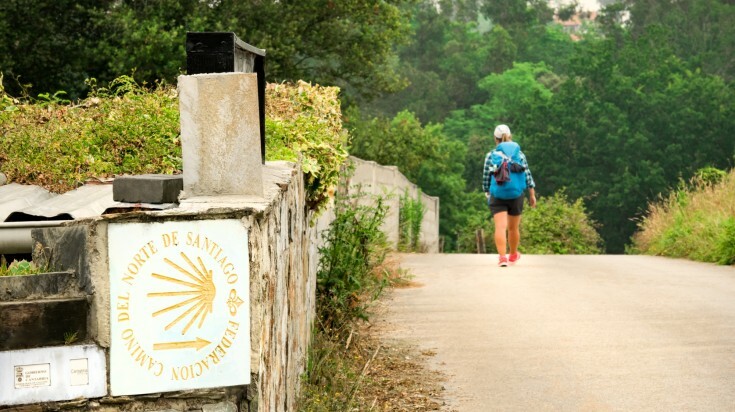 Also referred to as the way of St. James, Camino de Santiago is a pilgrimage to the town of Santiago de Compostela, where it is believed the remains of St. James are enshrined. 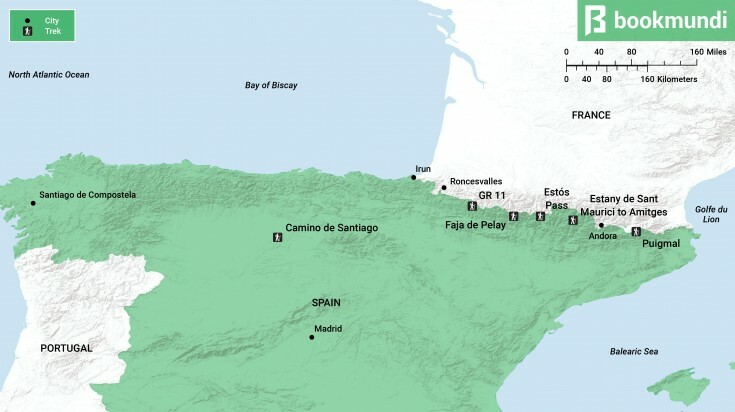 It is Spain’s most famous trek and each year hundreds of thousands of pilgrims seeking spiritual growth make their way to Santiago de Compostela. The route also attracts hikers and cyclists of all religious denominations who come to appreciate the beautiful scenery and incredible experience. There are many routes for this pilgrimage. The most popular amongst them starts in Roncesvalles on the Spanish side of the Pyrenees, and is known as Camino Frances. Difficulty: Varied. The start and end section of the hike is challenging, whereas the central section is easier. Getting there: The closest airport to Roncesvalles is Biarritz. From there you can travel by bus or train to Roncesvalles. GR 11, also known as La Senda is a collection of hiking routes spanning the Spanish part of the Pyrenees mountain range. It is divided up into 46 routes with accommodation, huts and camping points at the start and end of each route. While completing the entire route is possible, the trek is not attempted very often. Instead it is more common for hikers to opt for shorter trips which incorporate particular parts of the route. Start/end location: Starting at Irun on Spain’s Atlantic Coast, the route passes through Andorra and ends at Cap de Creus, on the country’s Mediterranean Coast. Difficulty: Challenging. There are many steep ascents and descents. The route is said to be less difficult after some time spent acclimatizing to the conditions. 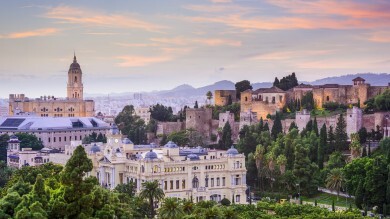 Getting there: Fly to Paris or Madrid, from where you can travel to Irun by train or bus. If you want to hike the French side of the Pyrenees, GR 10 is great hiking route. Spread across 156 square km, the national park is centred around Monte Perdido, the third highest summit in the Pyrenees. A stunning ensemble of canyons, valleys, and majestic peaks, the national park also offers splendid scenery of waterfalls, lakes, caves and meadows, making it a fantastic hiking destination. 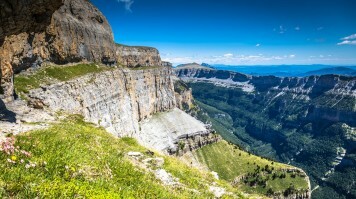 The Faja de Pelay is one of the most stunning hikes in Ordesa National Park. The Faja de Pelay begins with a steep climb up the southern slopes, followed by a walk along a wide ledge which outlines the valley, and then a descend towards the valley floor. The hike offers a brilliant mirador at the end of the climb with sweeping views of the valley. Start/end location: The hike starts and ends in Pradera car park/bus stop. Difficulty: Moderate. 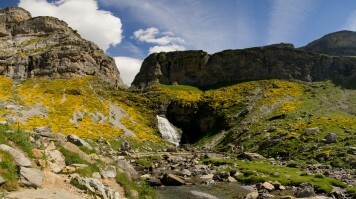 Ordesa also contains other hiking trails suitable for people of all ages and fitness levels. Getting there: Fly to Madrid and travel by car, train or bus to the town of Torla. From Torla you can take the shuttle bus to Ordesa National Park. Located in the north eastern sector of the Aragonese Pyrenees, the Posets-Maladeta Nature Reserve is an area rich in flora and fauna. At its heart is the Estós Valley, one of the most beautiful areas to explore in the reserve. Framed by some of the highest Pyrenees peaks, the valley is a harmonious setting of alpine woods, a waterfall, meadows, streams and rivers. A mountaineer’s dream, the valley is home to a scenic hiking trail that ends up in Estós Pass at 2,592m. Starting at Valle de Benasque, the route forms part of the famous GR 11 trail, before forking out to Estós Valley and then to the pass. Difficulty: Easy. There are no major ascents or descents. Getting there: The closest major cities are Barcelona and Toulouse. The best way to get to Posets-Maladeta Nature Reserve is to take a bus from either of the above cities to the town of Benasque. 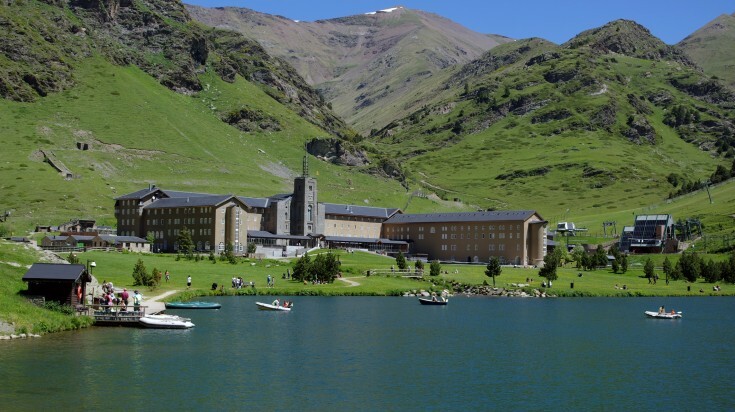 If travelling by car, you can drive to Benasque and leave your vehicle at the parking lot at Valle de Estós. The hike located within Aigüestortes National Park is a gorgeous route that takes you along some of the best spots in the park. 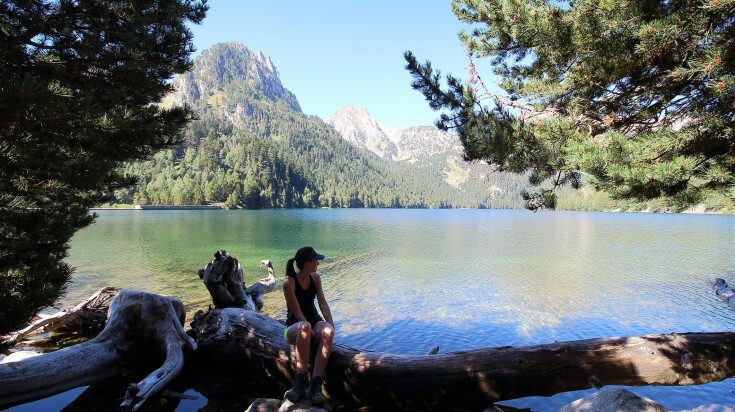 Starting from Estany de Sant Maurici to Amitges the hike takes you through a woody pine forest and past a waterfall. 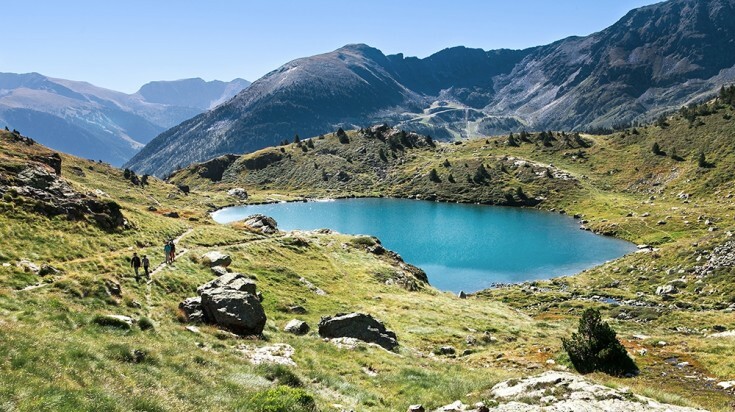 The highlight of the hike is the panoramic views from Amitges where you will behold iconic Pyrenean scenes of snow-capped mountains reflected in crystal-clear lakes. 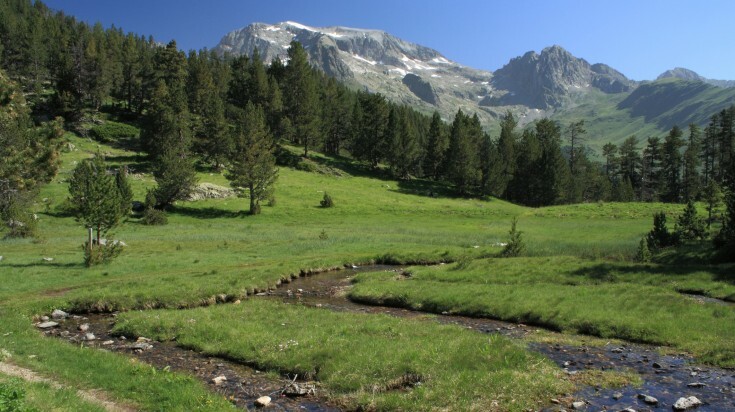 Aigüestortes, also known as the jewel of the Pyrenees, also offers plenty of pleasant forested routes that are ideal for families with children, with hiking distances ranging from walks as short as 0.5km and others as long as 55 km. Getting there: There are trains and buses from Barcelona, Lleida and Tremp to the towns around the Aigüestortes National Park (La Pobla de Segur, Esterri d’Àneu and Vielha). There is also a park bus which operates in the area and can pick up hikers from one point and drop them at the start of the hiking trail. Check out this tour in the Catalan Pyrenees, that includes snowshoeing in the Aigüestortes National Park. Puigmal mountain is located in the heart of Catalonia at the north eastern end of the Pyrenees. The hike to the summit includes passing through the stunning yet isolated Nuria valley at 2,000 meters. The summit marks the border between France and Spain and offers panoramic views of the brilliant French / Spanish terrain. Getting there: Take the train from Barcelona to Ribes de Freser. The town of Nuria can be reached on foot as part of a longer hike or by rack rail. The rack rail, can be boarded at Ribes-Enllaç, just outside the town of Ribes de Freser or in Queralbs. Join this full day tour to Nuria Valley, to get a taste of what the actual hike has to offer. 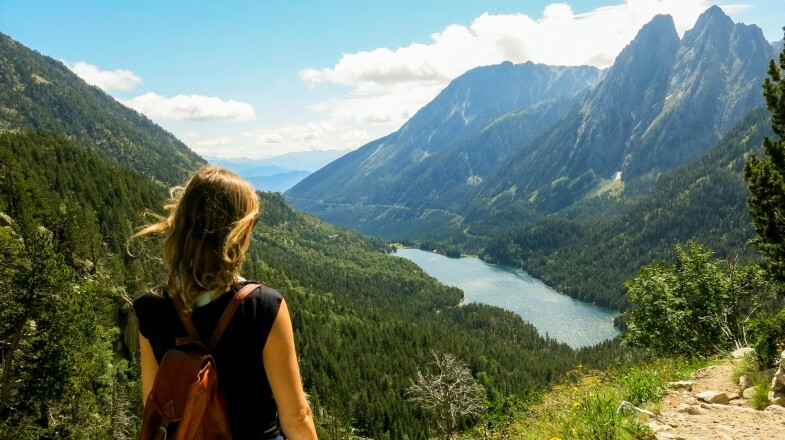 While the Pyrenees can be enjoyed year-round for skiing, mountaineering and ice climbing, hiking is primarily a summer activity lasting from April to November. Many routes and roads around the national parks may be closed due to poor weather in winter (December to February). It is best not to attempt routes that are closed as this can be dangerous. Always ensure that you have the appropriate attire, safety equipment and sufficient water for your hike in the Pyrenees. Read our guide for more information. Whilst most Pyrenees hiking trails do not require permits, it is a good idea to contact the relevant park authority prior to your hike to confirm opening and closing times, expected weather and permit / insurance requirements. Refugios are the huts or dormitories which offer basic rest facilities for hikers. There are many such places all along the Pyrenees. The various refuges offer ablution facilities, meals and accommodation. It is best to call ahead to ensure that accommodation is available at a refuge you plan on staying at. Pilgrims walking the Pyrenees route of Camino de Santiago should carry a document called the credencial. It can be purchased from any tourist agency for a few Euro. It provides the holder with access to accommodation and gets stamped by inns and restaurants along the way. This serves as a record of the pilgrim’s journey and can be presented as proof of the trek. It entitles the bearer to a compostela (certificate of completion of the pilgrimage). Cycling in the Pyrenees is another popular activity. 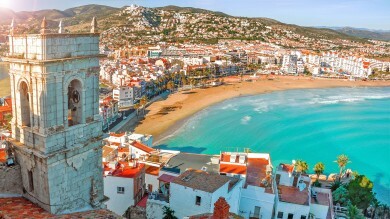 You might even recognize the terrain from popular televised cycling tours which cross from France into Spain as the Pyrenees mountains are traversed. From west to east, the Pyrenees mountains run through terrain diverse in climate, conditions and culture. They take in parts of Navarre, Aragon, Catalonia, and the Basque country, not to mention the independent state of Andorra. The many hiking trails offer excellent opportunities to get to know the lay of the land, in more ways than one. Many Pyrenees hiking trails are near fascinating little towns and villages. Part of the allure of hiking in the Pyrenees is sharing tips and stories with local people and other hikers. Often, this makes the journey all the more enjoyable.